Continuing on from the previous article on the source of all life, we looked at how energy makes up everything in existence throughout the universe and energy vibrates at certain frequencies depending upon what it is manifest as and its waveform and vibration level. Everything is energy and energy is an attractive force, binding together to form matter as we know it. We also know that energy cannot be created or destroyed, it can only change form. You may know of the book and corresponding movie "The Secret" that brought the Law of Attraction to the attention of millions of people around the world who previous to its release had no knowledge of its existence or its influence on their lives. The book and movie used a selection of a group of experts in the fields of science, medicine and quantum physics as well as experts in life coaching and personal development and also successful business people to tell of their knowledge of this incredible law of nature. If you read the book and/or watched the movie and had the sense to re-read/re-watch it several times over and over, then you will have gotten a much better understanding of the message it conveys than someone who merely read/watched it just the once and maybe dismissed it as just a load of nonsense. There is a lot to this law, while at the same time its precepts are very simple to understand as long as you can grasp the concept. The easiest way to do that is to use as an example an everyday object that you are most likely familiar with. A magnet. Magnetism as we know and understand it is an attractive force that causes metallic object that are magnetised to attract to one another. A regular bar magnet has two poles, positive and negative and we know that the force of magnetism will cause opposite poles to attract while like poles will repel each other. 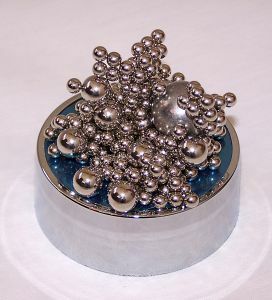 I'm sure you will remember those classroom science experiments where you used a bar magnet to attract iron filings to it and to also plot the path of the magnetic force from the positive to the negative poles. This is a force that we understand because we can see it in action in everyday things, such as those fridge magnets that you can stick to your fridge door. They stick because the magnet inside them attracts to the metal of the door and holds fast until you tear it off. But you can actually feel the magnetic attractive force when you hold the fridge magnet very close to the metal door without it actually touching. There is a strong attractive force that you can really feel as the magnet tries to pull closer to the metal door. The Law of Attraction works in a similar way to a magnet, except instead of it being an attractive force between metals, it is an attractive force between frequencies. In actual fact, the Law of Attraction is a secondary law, with the primary one being the Law of Vibration. This covers the way that energy is measured in waves as it vibrates, with each wave having its own frequency. Energy is what comprises the very essence of the atom that we know about and we know that an atom comprises a central nucleus of protons and neutrons with electrons orbiting that nucleus, just in the same way as our moon orbits the Earth, or the Earth and the other planets orbit the sun. This vibration is something we can measure with sophisticated instruments and so we know that different atomic structures vibrate at different frequencies but we also know that energy itself vibrates at different frequencies and its frequency can be altered depending upon certain influencing forces. We know that we humans are composed entirely of energy and that everything we sense through our natural five senses of sight, hearing, smell, touch and taste is also made up of energy. We also know that things we cannot sense such as radio waves, certain sound waves and even light waves that are outside the visible spectrum are all made up of energy. Probably the toughest part to comprehend is the fact that even our thoughts are made up of energy and thus vibrate at certain frequencies depending upon what we are thinking about and what emotion is driving or being driven those thoughts. Thoughts are far more powerful than we have ever imagined because they not only have the ability to vibrate at their own frequency, they can alter in frequency depending on what we are thinking about and even more fascinating is that they can attract energy to them that is vibrating on the same frequency. Thoughts are probably the most interesting of all forms of energy, because they are created and altered at will by a person's mind. The mind is a creative force that is capable of creating thought which is believed to be able to travel immense distances instantly. This means that thoughts, when properly devised and directed, can influence energy in all places that vibrates on exactly the same frequency. Nature itself is a creative force but instead of being a random creator of energy as are thoughts, she follows strict laws that govern everything else in the universe. If you plant a seed of corn, you can expect to grow corn as long as you give the seed all the right circumstances for it to grow, such as soil, sunlight and water. But did you also know that a seed of corn vibrates at a certain frequency too? And when it is planted in the soil, it attracts energy from around it that is vibrating on the same frequency. So it attracts only those nutrients and the moisture that it needs to grow, while all other frequencies of energy in that soil are ignored so that it can follow nature's strict laws and grow into a plant that will produce corn. The mind also follows nature's strict and disciplined laws in every area except one. That is in the power of thought. Thought energy is a creation and so each and every thought that your mind thinks about is a creation. Because each thought is individual and unique to the person thinking it, it can be whatever the person wishes it to be. Where nature must produce a corn plant from a seed of corn, the mind can create a thought and change it at will to whatever it wants to. Energy vibrates at millions of different frequencies. Each thought that you create vibrates on its own frequency and that frequency will match that of an energy form somewhere else. If you desire a thing and think about it, then that thought will be on the same frequency of the thing you are thinking about. Like energy attracts to it. Now can you see something emerging that is so powerful that you would never have thought it before yet it can be used to bring about the life that you want to live when this power is used properly? The problem for most people is they don't use this power because they don't know how to use it. And even the majority of those that do know how to use it don't because they are too lazy and refuse to make the sacrifices necessary to profit from it! In a subsequent article, I will explain how you can use this power and the inherent infinite intelligence that accompanies it to your advantage. With practice and persistence, you can create the life you want simply by thinking it into existence! Additionally, you may have heard of what is referred to as the eleven forgotten laws, which is a training program conceived and produced by Bob Proctor and Mary Morrissey. This is essentially an extension of The Secret which has been described as merely pop culture fluff! While The Secret did a fantastic job of bringing the very existence of the Law of Attraction to the masses, what it didn't do was explain it fully so that it could be used to its greatest potential. By pandering to media constraints, the movie highlighted all the areas that would appeal to the greatest audience while playing down or even omitting the more important parts of this miraculous whole. Well now you can access those areas that the movie missed out on and discover how the Law of Attraction really is working in your life. Learn the aspects of the law that will enable you to leverage it to improve every area in your life. Discover the rest of the great truths that lead to a better life and find out what has really been holding you back!